Lafayette Regional Health Center’s new outpatient clinic provided much-needed growth for the facility. This 10,000 square foot addition relocated the facility’s existing outpatient clinic, providing the opportunity for expansion and the creation of dedicated walk-in patient and ambulance entrances in the adjacent emergency department. 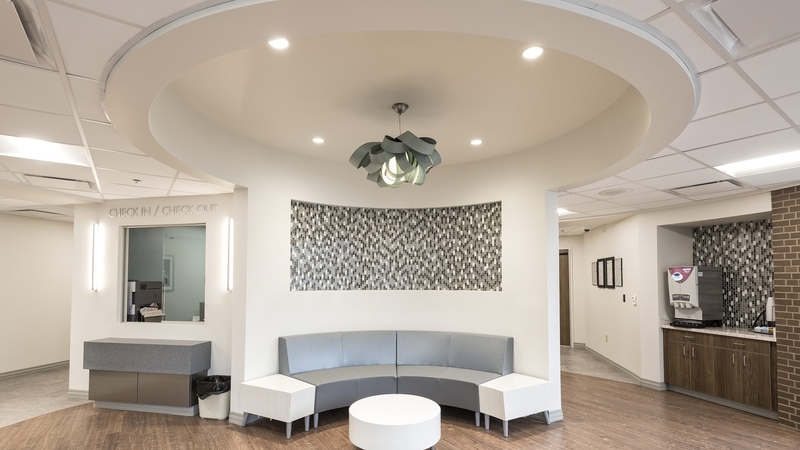 The new addition increased clinic capacity from four to thirteen beds, created dedicated treatment rooms, and provided larger work spaces for clinicians and staff. Additionally, the clinic addition project expanded the hospital’s main entrance to provide a centralized drop-off location for patients and visitors. These improvements introduced a modern aesthetic as a basis for future renovations of the existing facility’s exterior and interior. Thirteen multi-purpose exam rooms for use by visiting physicians throughout the week. Three-chair infusion space designed to provide maximum natural light. Dedicated rooms for stress and pulmonary function testing, pain management, and advanced treatment. Staff work areas including two nurse stations, physician dictation room, staff lounge, registration work area, and conference space.